The Jammu and Kashmir Festivals successfully satisfies the diversity of many Indian cultures. To the visitors these festivals reflect the true religious beauty of this state. The state of Jammu and Kashmir can be divided into three zones: 1) Jammu which thrives with Hindu Population, 2) Kashmir is full of Muslims and 3) Ladakh houses many Buddhist monasteries. The festivals and the fairs organized in the state bring out the colorful nature of the diverse cultures that reside here. It also signifies the peace and harmony between the communities who occupy the state of Jammu and Kashmir. Every festival is celebrated with equal zeal by people of all religions. This kind of celebration means a lot in today’s world which is practically broken by religious rifts and wars. 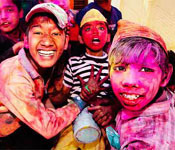 The sense of celebration among the people in Jammu and Kashmir is so great that you would want to experience it again. You will find no other place in India where people celebrate all religion festivals with equal enthusiasm. The beautiful valleys of Kashmir, the religious shrines of Jammu and the peaceful monasteries of Ladakh together put into action many series of festivals in Jammu and Kashmir throughout the year. Whether it is a Muslim, Hindu or Buddhist Festivity, it is celebrated with equal zeal by all the people. Some common religious festivals celebrated here are Diwali, Holi, Eid, Christmas, etc. Apart from these common religious festivals the state also celebrates all National festivals with enthusiasm. The best thing about festival celebration in Jammu and Kashmir is that they don’t care what religion you belong to, if you want to participate in a festival, you can do so without any restriction. All festivals irrespective of their religion are celebrated with equal happiness and excitement. For example Lohri is celebrated with same enthusiasm as Diwali or Eid. If you visit Jammu and Kashmir during a festival season then you will be able to experience the true culture and the festive mood of the people of this state. The colorful celebrations, the tasty feasts, the great hospitality and the communal peace will impress you so much that it can be guaranteed that you will want to come again to enjoy a festival here. Every tourist is amazed by the celebration of all religion festivals with equal zeal and enthusiasm by all the people. When it comes to celebrating a festival, people put behind distinctions like caste, creed or religion and participate in the occasion to make the festival more joyful and fun. After all religious obligations have been taken care of people dress up in new clothes, dance, sing, exchange sweets and have fun all day long. A festival means a day of delicacies, dance and dynamism. This festival is celebrated every year on 13th of April. This festival holds great importance to the Sikh community and the marks the starting of a new year. The Sikh community has a large population in Jammu and in some parts of Kashmir due to which the festival of Lohri is celebrated with great enthusiasm in Jammu and Kashmir. This festival signifies the starting of the new harvesting season and is strongly believed by people of Northern India. Lohri brings along with it many fairs some of which lasts for days while some for weeks. If you are interested in doing some traditional shopping then visiting these fairs would be a good idea. Lohri is also said to be the birthday of Guru Gobind Singh, the tenth Sikh Guru. Eid-ul-Fitr and Eid-ul-Azha are the two most prominent Muslim festivals that are celebrated in the state of Jammu and Kashmir. To experience the ultimate Muslim festivities of Eid you have to visit the Kashmir Valley where the majority population is of Muslims. Jammu also celebrates Eid with zeal but Kashmiri Eid is something else. Eid-ul-Fitr is celebrated after a month long fasting of Ramadan or Ramzan. On the day of Eid Muslims offer a six time namaz prayer instead of a five time namaz prayer. It is the most important day of the year for Muslims and they celebrate this day by feasting, exchanging gifts and wearing new clothes. Eid-ul-Azha is the Bakri Eid which celebrates the concept of kurbani that is sacrifice. A goat is sacrificed in every Muslim household on this day. In some places camel and sheep are also sacrificed. Hemis Festival is celebrated in Ladakh and is a Buddhist festival. It is celebrated to commemorate the birthday of Guru Padmasambhava. The Hemis Festival takes place in the extremely large courtyard of the largest Ladakh monastery. The date of the festival is decided according to Tibetan Calendar and is celebrated on 9th, 10th and 11th days of the fifth Tibetan month. These days remind the Buddhist monks of the time when Guru Padmsambhava gallantly fought and defeated evil demons. To tell this story of victory of good over evil the lamas and common people dress up in traditional clothing. Some even wear age old masks. A dance performance also takes place which depicts the story of the Guru defeating the evil demons. The dance performance is out of the world and the music from the drums and the horns will give you Goosebumps along with an eerie feeling. Lohri also known as Makar Shankranti is an important Hindu Festival. Every year it is celebrated on 13th January to welcome the oncoming Spring Season. The celebration generally takes place at night when people gather around a huge bonfire. People sing, dance, exchange sweets and throw rice into the fire on this auspicious day. Jammu and Kashmir has many holy rivers and people are said to take a bath in these rivers to cleanse their soul for this festival. In the rural areas it is celebrated with much more joy and enthusiasm. In rural areas it is celebrated a little differently as young kids get gifts and spend time with newlyweds and new parents also receive gifts for their new born child. Young boys perform a special type of dance on Lohri called Chajja Dance which is quite entertaining and fun. Festivals like Lohri bring together people of all religions and give them an opportunity to celebrate the joy in their life. Many fairs and festivals are organized in Jammu and Kashmir during Lohri. These fairs and festivals are best for shopping traditional apparels, ethnic jewelry and shoes, hand-woven Kashmiri carpets, local handicrafts, etc. The fairs are the best place to experience the true Kashmiri culture and shopping for traditional items. The Urs also known as Ziarats is a typical Kashmiri Muslim Festival. Urses are held on death anniversaries of Muslim priests and saints and generally celebrated in their shrines. Some popular Urs festivals celebrated in the region include Urs of Batamol Sahib, Urs of Meesha Sahib, Urs of Bahauddin, etc. These Urs are very popular and celebrated with great enthusiasm despite of the rough weather in the region. It is celebrated in many places in Srinagar and attracts not only Muslims but Sikhs and Hindus also. Sindhu Darshan is another major festival in Jammu and Kashmir. People from all over the state come to Leh to celebrate the origin of the river which gives life. Buddhist Monasteries can be found in abundance in Leh and Ladakh due to the heightened Buddhist population in this region. The festival of Dusshera is celebrated extravagantly in Jammu and Kashmir. On this day the war weapons and instruments are hallowed and after that they open a campaign. Three gigantic figures of Ravana, Meghnada and Kumbhkarana are made and stuffed with gun powder and fire crackers. These figures are placed in the center of a large open ground where the people of the city can gather and watch the burning ceremony of the demons. Little kids dress up like Ram, Sita and Lakshman, the characters from Ramayana. There is also a play depicting the whole story of Ramayana. When the play is over the Raja of Kashmir sends his troops with guns and instructs them to burn the figures of the three demons. The person who is dressed up as Rama is responsible for setting fire to the figure of Ravana while Laskhman and Hanuman are responsible for setting fire to the other two demons. They all discharge arrows at the three demons. The fiery arrows cause the explosion of the three demon figures which is followed by victory shooting by the cavalry. People applaud as they witness the downfall of evil. Jammu thrives with Hindus whose main festival of the year is Diwali. 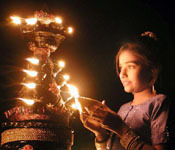 It is celebrated in the month of November and is also known as the festival of lights. People dress up in new clothes, light diyas and candles and play with fire crackers. As Diwali is the most important Hindu festival of the year it is celebrated with extra enthusiasm in Jammu and Kashmir as well. Vaishno Devi is a temple of Vaishno Mata who is a form of Maa Durga. The temple of Vaishno Devi is situated 14 kilometers away from the town of Katra. Vaishno Devi is one of the most popular temples in India and the Vaishno Devi festival one of the most important festivals of India. Unlike other Indian festivals the festival of Vaishno Devi lasts for three months that is from September to December. If you visit the state of Jammu and Kashmir during the festival season you will be able to see the true colors of the diverse religions and cultures that reside in the state. The citizens of this heavenly state don’t need an extra reason to celebrate all festivals irrespective of their religion. The local dance and singing and the folklore make the festivals a grand affair as you get the glimpse of the local culture of Jammu and Kashmir. If you celebrate a festival in this state you are bound to get amazed by the color, happiness and joy the festivals celebrations bring along with it.